Sailing Deck can accommodate 50 people for seated dinner, or 100 standing room only. The 100-person capacity incudes any hired catering staff, bands, etc. Use of kitchen includes sink, microwave, and refrigerator. Outside grounds includes use of gas grill (provide your own fuel or $10 fuel charge) and will allow for a tent to be utilized. TERMS AND CONDITIONS: The parties agree to the terms, conditions, and policies as set forth in this document. However, each rental contract may vary depending on specific requests and in these instances the Facility Rental agreement overrides all other statements. 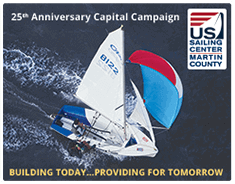 MEMBER & NONPROFIT DISCOUNT: The Sailing Center offers special pricing for USSCMC members and not-for-profit organizations (i.e., a 501(c)(3) charitable organization). Please contact Sailing Center for special pricing. RESERVATIONS: Reservations will be accepted no more than 8 months prior to an event. A 25% deposit will be required at time of reservation. SECURITY DEPOSIT: Security Deposit is due in full on or before 30 days prior to the event. Security Deposit will be returned within 15 business days after the event. USSCMC staff will inspect building and grounds to determine that user/renter cleaned up as agreed in facility rental agreement. ALCOHOL POLICY: Alcoholic beverages are prohibited without a $1 million insurance liability policy with the alcohol clause naming USSCMC and the Martin County Board of County Commissioners as additionally insured. If USSCMC determines there is alcohol use by anyone under 21 years of age, USSCMC reserves the right to cancel the event, keep all monies and contact appropriate authorities. Liquor can be served, but not sold in any manner. CATERED EVENTS: 1) All food must be prepared by a licensed caterer. 2) Set-up and break-down of catering equipment is the responsibility of the caterer and must be completed within hours allotted on the rental agreement. 3) Clean up and removal of all trash, decorations, and floral arrangements is user/renter responsibility. USSCMC staff will assist with set-up of trash containers. 4) All tables and areas used by the caterer must be wiped clean. Notify USSCMC staff of any spills or stains. 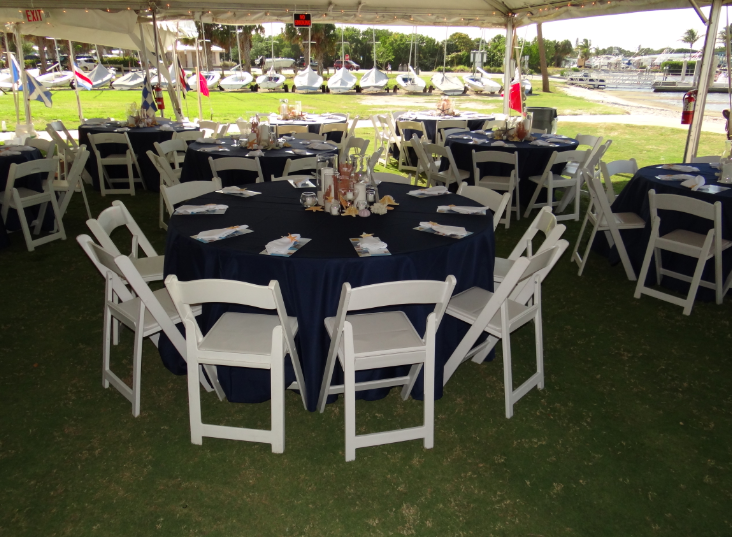 NON-CATERED EVENTS: USSCMC is not liable for any food or beverage supplied or served by user/renter. TENTS: Although USSCMC does not provide tents for events you may include a tent as part of your facility rental agreement. Tents larger than 10 x 10 will require a permit, which is normally supplied by the tent rental company. Location of tent requires approval and tent must be secured to the ground. Tents must be removed from the event grounds by 10am the following day of rental. DECORATIONS: With the beautiful waterfront setting, you don’t need to bring much. Please limit to tables and food service bar. Self-standing decorations or decoration that may be tied to the building are permitted. However, use of nails, thumbtacks, tape, glitter, confetti, seeds, fireworks, sparklers, balloons, or anything similar that could blow in the water is not permitted. PARKING FOR LARGE EVENTS: For events of 150 or more, the user/renter will be responsible for staffing a parking attendant to direct guests to appropriate parking areas. ACCESSIBILITY: The Sailing Deck (meeting room, outside deck, handicap bathroom, and kitchen) is wheelchair accessible. BOATS AND DOCK: Kayaks, sailboats, and docking of boats/personal watercraft are not included in facility rental. Boats may be rented for additional fees. SMOKING: Smoking is not permitted in the Sailing Center facility or within 10 feet of the building. Please dispose of smoking materials appropriately. CHAPERONES: Adult chaperones are required at events where children under 21 years of age will be in attendance. SOUND SYSTEM: The Sailing Deck has a sound system, speakers, and portable microphone (1). As it is an intimate space, things like amps and large equipment are not needed. Power-wise, the Sailing Deck can accommodate a small 3-4 person band with reasonable sized speakers. Sound must be kept at an acceptable level and not in violation of any city or county regulations. LOSS OF PROPERTY: USSCMC is not responsible for damages to persons or property, or loss of property at USSCMC prior to, during, or following the event. EVENT SETUP AND CLEANUP: Event set-up & cleanup are not included in the rental rate and is the responsibility of user/renter. All areas used must be returned to the condition and order they were in before scheduled use. All garbage must be deposited in the dumpster and/or recycling containers. All rentals exceeding their check out time will incur a late fee of $50.00 for every 30 minutes. In addition, any clean-up that must be done by USSCMC staff will be charged to user/renter at a rate of $50.00 per 30 minutes and will be deducted from the security deposit (see Security Policy). Click here to view PDF with full details.